The coolest part wasn’t watching the race though, it was getting to talk to the team about nutrition. I know, I’m more of a nutrition nerd than cyclist fan girl. But seriously, I enjoyed asking some questions and getting to hear what these high performing athletes do to make sure their bodies are fueled for success. Tejay van Garderen, Brent Bookwalter & Nathan Van Hooydonck shared some personal insight on their nutrition habits. Tejay expressed the emphasis on carbs for pre-race nutrition (porridge and toast with eggs seems to be his go-to). He also shared that during a race, you do what you can to get enough in without over stressing the GI system. Since cyclists at this level of training and competition need so many calories and nutrients, supplements play a role in making sure those bases are covered every day. Brent was very passionate about making sure his macronutrients and electrolytes are dialed in to support his performance goals. He also mentioned antioxidant support as being crucial to his nutrition plan to help his body adapt positively to its stressors. The message shared by the entire professional team was that nutrition isn’t an afterthought. Without enough fuel and hydration, they cannot perform. End of story. Foods and supplements that meet their individual needs are consumed before, during, and after the race with equal importance. I also got to chat with Swisse Wellness’ Managing Director Oliver Horn about the company’s commitment to quality ingredients, research backed product development, a diverse line of vitamins and supplements, and staying in touch with what their consumers are looking for and in need of. In this case, the consumers are professional cyclists competing in a world tour race. As an elite athlete with sponsors of my own, I completely appreciated Swisse’s commitment to supporting these athletes; not only with product, but also by personally attending and cheering along the team. One of the products making its way into the hands of athletes is Swisse Wellness Ultiboost Co-Enzyme Q10. This co-enzyme targets the mitochondria, cellular powerhouse, helping to prevent antioxidant damage, generate more energy and decrease muscle soreness. While I remain committed to whole foods for nearly all of my vitamins, minerals, and phytonutrients whenever possible, research shows that it is practically impossible to get beneficial levels of this co-enzyme through food consumption. A diet high in foods supplying Co-Enzyme Q10 will provide the body around 30mg, while beneficial doses seem to be above 100mg a day. For me, this product adds to the fueling, macronutrient, and hydration needs of a pro cyclist, and I was excited to learn about it during my day spent with Swisse Wellness and team BMC. In seeking an additional competitive edge, and to boost my energy level and my body’s ability to regenerate and repair, I’ve recently started taking Swisse Wellness Ultiboost Co-Enzyme Q10 supplement and am finding taking this one-a-day formula is a super simple way to gain extra performance and a health edge. In order to step up my racing game and feel my best, I’m excited to be able to try a product that’s both backed by research and validated by Team BMC, racing bikes at the highest level of the sport. This is a true example of where supplementation makes sense. Check out the image gallery below to get a look at my first-hand experience at the race as I met the team, hung out in the VIP area, and rode in the team caravan car during stage one of the Amgen Tour of California. Head over to swisse.com for more information about Ultiboost Co-Enzyme Q10 and its other products, or follow them on Facebook, Instagram and Twitter. Riders come back to the team car throughout the race to grab hydration & nutrition. Team car is stocked with nutrition to keep these pros fueled. The view from team car that follows behind the race. A glance into the team’s equipment trailer. I’m front seat in the team’s caravan car, getting to watch the action unfold! Oh heyyyy, just me and the wheels here. Go BMC! I’m in the VIP area, watching the racers drill towards the finish. 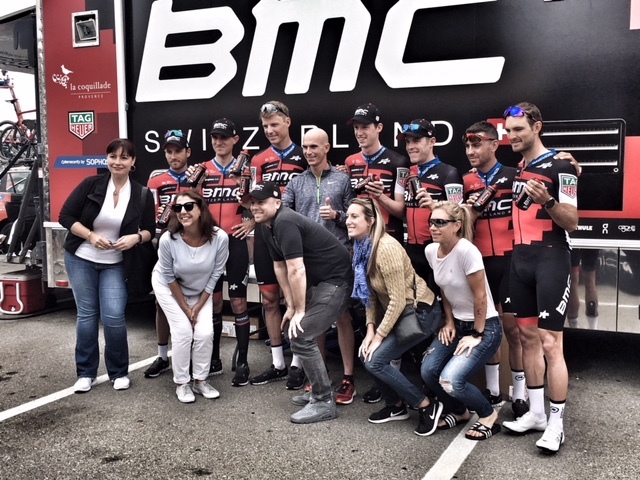 Just hanging with the professionals of the BMC team for Amgen Tour of California! The team sips lots of fluid before the race so they start well hydrated. TeJay rests his legs while we chat before stage one. This is a peak into the team trailer where the food and drinks are stored. Brent’s power stance. He’s ready. BMC bikes are so pretty. I know I love riding mine! These racers might go through 2 bottles an hour x 7 riders = lots of water on hand. I got a prime spot to watch the best sprinters in the world cross the finish line!